"This is an incredibly intriguing ale is made by aging our Old Heathen Imperial Stout in oak barrels that were used for making fine Kentucky bourbon! The result is an extraordinary, dark, and mysterious stout whose very essence has been enhanced. The aroma is filled with vanilla, cocoa, and roasted coffee beans. This silky-smooth brew has notes of oak, whiskey, roasted barley and vanilla that meld together on the tongue to create an incredible sensation." This was given to me years ago by a buddy of mine and has just been sitting in my fridge ever since. Well, you don't want to hear my life story, so let's get to the beer. Pitch black appearance with no brown or ruby red. The pour gave off less than half a finger of khaki-colored head. Aroma had a smooth, pleasant oak and bourbon smell. Behind that are cherries and dark fruits and even a dark fudge chocolate brownie presence. I'd say the taste is on point with the aroma and no more/no less. The sweet, but not too sticky bourbon hits first followed by the dark chocolate ahead of the cherries and dark fruits. I thought it would be the other way around based on the aroma, but no big deal. The dark fruits give this stout that Russian Imperial Stout taste and feel which makes it seem bigger than 8%. I get a lot of oak in the middle of the mouth and near the back end, which just adds more barrel complexity to this beer. There's an overall coffee ground taste surrounding the whole experience, which makes this bitter at times, but it's not as enjoyable as I'd like it to be. The finish ends with some plum, raisins, and figs. Mouthfeel comes up a little thin for an 8%, barrel-aged stout. It doesn't coat the mouth at all, but it isn't watery either. The body is like mine: simply ok. On the plus side there's no alcohol or burning/warming anywhere to be found. It drinks lighter than its abv would lead you to believe. 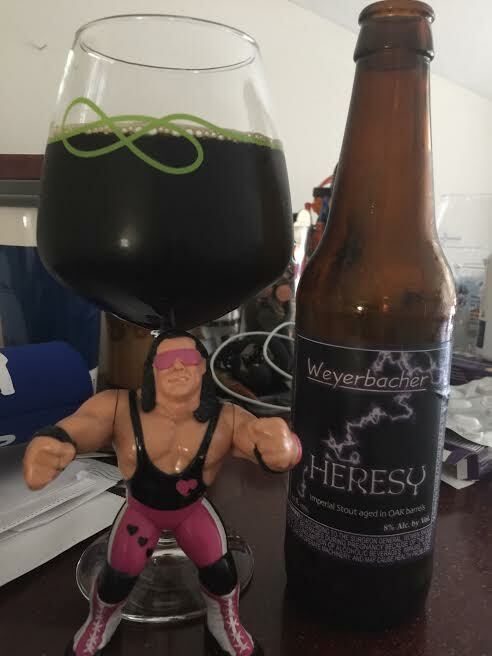 After so many years in the bottle and so many months in my fridge, Heresy is a perfectly acceptable barrel-aged stout. There's not too many shortcomings to point out, but at the same time nothing dazzles me either. The bourbon is nice and sweet while the base beer had plenty of those RIS characteristics. Not a mind-blower, but still solid.